250 miles of ‘War Medal’ ribbon issued. 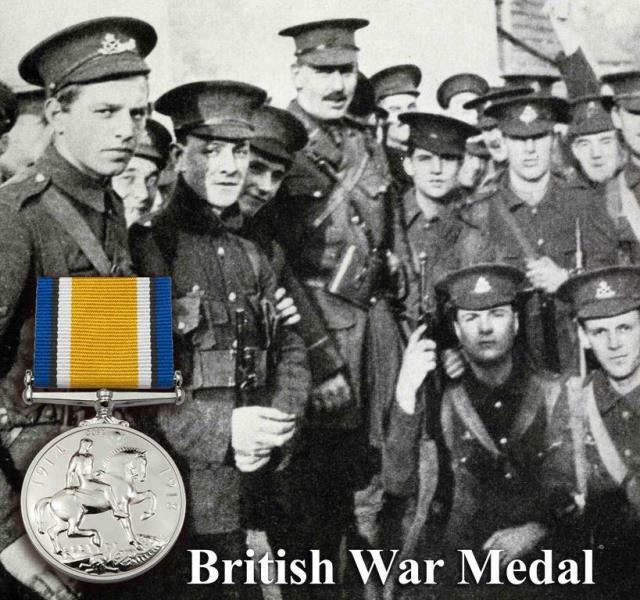 The British War Medal was a campaign medal of the British Empire, for service in World War One. It commemorates some of the most terrible battles the world has ever known. The causalities in the Ypres Salient and on the Somme for 1915 to 1918 were more than our total for the Second World War. Within the publication ‘The World Today – A Weekly review supplements to the Great War, Part 264 Sept 1919’ The War Office announced that the British War Medal Ribbon may be worn by all ranks who were entitled to the award of the medal, and that in each case a preliminary issue of two inches of the ribbon will be made. The total number, including both those who are serving and those who have been discharged or demobilised, who will be entitled to this preliminary issue, is approximately 8,000,000, so that the total length of ribbon to be issued will be about 250 miles. It took a considerable amount of time before the issue was complete. If you're looking for a replica medal, that your ancestor was awarded during wartime, look no further. Our medals are lovingly reproduced to an outstanding quality by a family run British company, and we're offering you a discount on the entire range, which includes Campaign and Gallantry awards. Campaign medals were generally given for being involved in a certain campaign, whereas Gallantry awards were received for an individual act of bravery. Now you can honour your ancestors with a replica medal that they would have proudly worn. Take a look at the range we produce, but hurry, take advantage of this offer soon!